The PCRmax Eco 48 utilises patented block and optical technologies to deliver extreme speed, sensitivity and data quality, with optimised protocol as fast as 15 minutes, all using standard plasticware and consumables, sensitivity down to 1 copy detection and the world most accurate block the Eco 48 will deliver Speed. Confidence. Performance. Value and Sensitivity. The Eco 48 software provides instrument control, data collection, and data analysis. 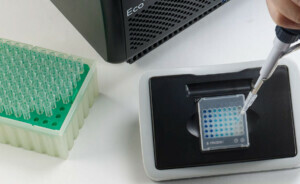 The most common qPCR parameters are automatically in place. These can be easily changed on the computer to meet specific experimental requirements.